Ah, money. It's a taboo topic to discuss, but one that everyone definitely wants to know more about. I've recently started participating in a few unique ways to make money blogging, and I wanted to share a few tips with you today. This post definitely goes out to my fellow bloggers, but I also wanted to share for my non-blogging readers for transparency's sake. After all, it's all about honesty around here! Of course there's the usual sponsored posts; you know the ones: dresses c/o this boutique or meals c/o that PR firm, but what about the ways to make money that are different than that? Let me introduce you gals to Linqia and Izea. Linqia and Izea are two sponsorship platforms that I've spent the past month or so experimenting with, and I have to say that I absolutely love both sites! Both have already turned out to be lucrative, and both have been super fun to participate in. Izea is "sponsorship marketplace" where brands can connect with tastemakers for a range of sponsorship opportunities. The opportunity that has been the most successful for me so far is writing sponsored tweets. 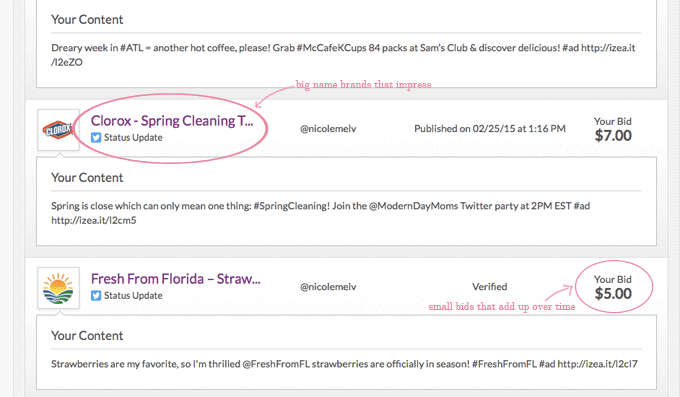 I've done several sponsored tweets so far for companies ranging from Clorox to Alexa Foods to Florida Strawberries. Big brands, right?! Signing up is free, but my advice is to go ahead and purchase the standard membership (it's $1 per month). You get unlimited advertiser pitches with this membership which means more opportunity for income. With Izea, you log-in to your dashboard and either bid or decline offers. I check mine daily because there's almost always something new, it's fun, and I'm a little bit obsessed. I've been a member for about a month and have made nearly $50 just doing sponsored tweets. Crazy! I also want to make sure I introduce you to Linqia. With Linqia, you register to be a member (this is free). Then, you play a little bit of a waiting game. A campaign manager will email you when they have a campaign that they think fits your community. I have gotten one campaign so far (I signed up mid-January), and I earned $50 + $25 reimbursement for supplies/giveaway materials. Plus, the campaign is with Publix! I love that this particular community works with major, corporate brands, and you get paid almost immediately - no payout minimum required! For Linqia you have to reach a certain number of clicks to get your payout. For ease of math, let's say that you get $1 per click, and you have to get 75 clicks to meet your minimum. If you get your clicks, you'll make $75! If you make over your clicks, you'll get a higher per click rate for your next campaign. But what if you only get 54 clicks? You'll get $54. So no matter what, you're getting paid! Easy right? 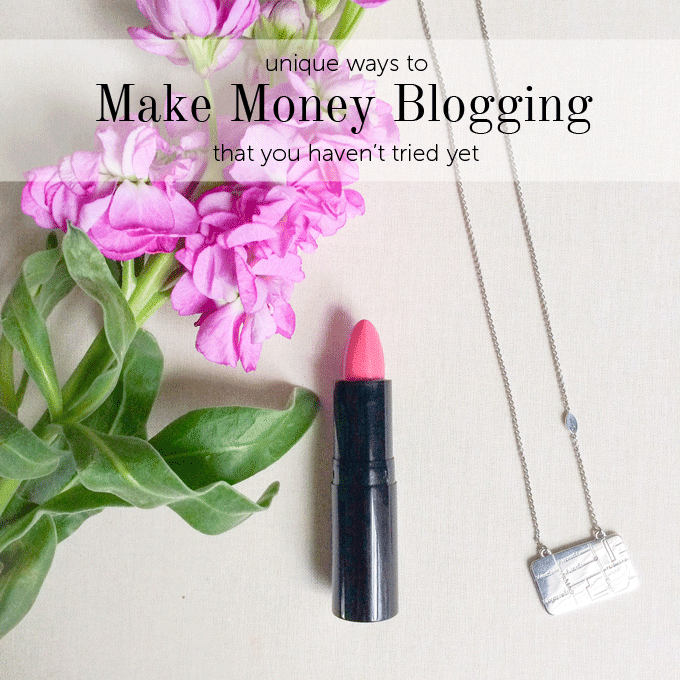 There are tons and tons of opportunities out there to monetize your blog, but these two are working for me right now, and I absolutely love both! Full disclosure: I did use my referral links for both Izea and Linqia, and if you decide to sign up, I'd love for you to use my links!